About five miles downstream from the Bullet Canyon confluence, Step Canyon joins Grand Gulch from the north. Near the mouth of Step Canyon several unique pictographs occur, part of a panel of very colorful glyphs. This site is often referred to as Quail Panel due to the 3-foot painting of a quail, complete with a topknot and a green and brown eye. The eye is both oversized and a dramatic perfect circle. 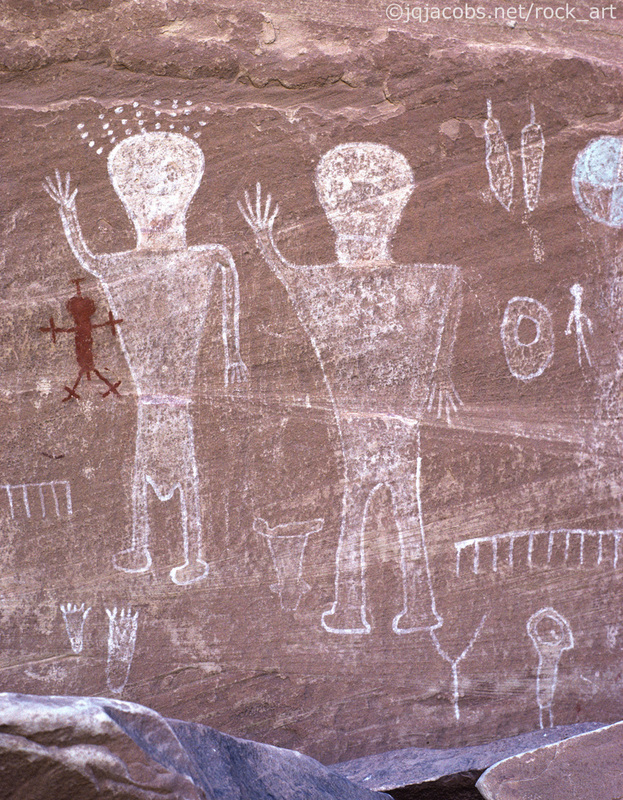 Yellow men with brown duck heads, green men with arcs for heads, a crouching, side view anthropomorph, some very faint white anthropomorphs, a little brown anthropomorph in side view holding an atlatl half again his height, lots of brown handprints and a corn plant are all depicted. Off to the right a very intense looking red and white mask stares directly at the viewer from the sandstone. Continuing downstream ducks, duck-headed men, handprints, red and yellow men, bird figures, white anthropomorphs and long legged birds decorate shelters within the deep canyon. The hiker will pass Long House Ruin, a well-preserved structure along a ledge on the right, out of view from the trail in the arroyo. Here a group of white dots, green men and a large duck are painted. Just over five miles below Step Canyon, at 24.7 stream miles from Kane Gulch, one of the panels of large anthropomorphs is found high above the canyon floor in a northerly facing alcove on the east side. The site is easy to pass by and well worth the effort to find. 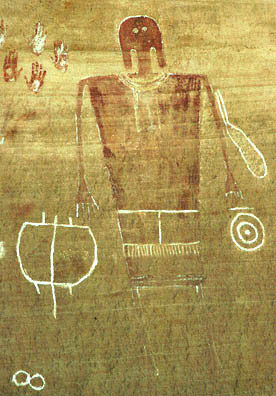 One of the large figures at Big Man Panel has a waist decoration similar to the large anthropomorphs on the San Juan River at Butler Wash confluence. I suspect that this represents a skirt. Big Man Panel is named for the other large, dominant Basketmaker Style figure with its more certain gender identification. They both have rounded heads with ghostly eyes and pigtail hair. Their shoulders are broad and square. Their torsos include outlining and detailing in white. Handprints, smaller anthropomorphs, geometric figures and tally lines surround them, mostly in white paint. Another mile and a half downstream the hiker passes Polly's Canyon on the east. A spring is located a short distance therein. 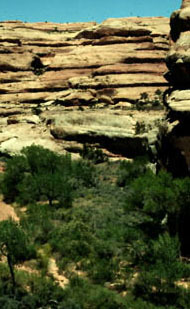 Polly's Island, across canyon, is an ancient meander of the Gulch, one of the rare points where water washed a shorter path through the durable sandstone. An immense redrock island in the sky has resulted. Along Grand Gulch, at the midpoint of Polly's Island, Government Trail, one of the few trails in and out of the Gulch, climbs the east wall. It is a two mile hike from the Gulch to the end of the very bad nine-mile-long two-track from Highway 261. This is a difficult trailhead to find, and, as I found out on my exiting in near darkness, so was my vehicle. Continuing downstream, a large petroglyph panel, a sort of "Newspaper Rock" with many densely packed figures of varying ages, follows. Some of the figures are very faint. Nearby is a very faint, heavily patinated Archaic Style panel. A four foot high red clay anthropomorph is seen above Round House Ruin. Look for a red shield at Bannister Ruin in a south facing alcove, just before Bannister Spring (7 miles from Government Trailhead, 33.3 miles from Kane Gulch.) 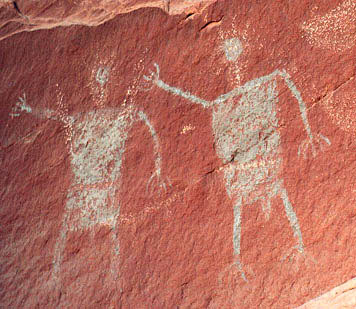 Watch for four large Basketmaker anthropomorphs and some smaller Puebloan ones at a site before Collins Canyon. 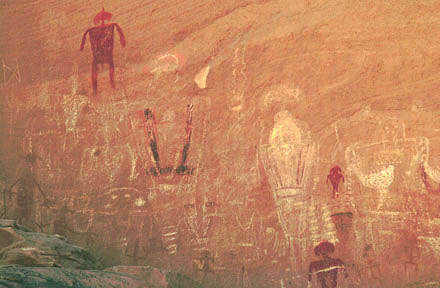 In a rincon just before the side canyon numerous figures are found, including ducks, a Kokopelli, atlatls, and large white anthropomorphs. The Collins Spring trailhead is two miles up this west-side branch canyon. The trailhead is accessed from Utah highway 276, the road to Hall's Crossing on Lake Powell in the Glen Canyon National Recreation Area. At the Collins Canyon confluence (mile 36) Grand Gulch begins tending in a southerly direction, however unevident it is to the hiker dizzied by the continuous meanders. The canyon also becomes shallower in this area and hikers, just as did the prehistoric inhabitants, find themselves less sheltered from summer heat. Deep narrow canyons can be quite cool and refreshing on a hot summer day. A shallow canyon reflects sunlight and can be hotter than the surrounding mesa tops. Be prepared for scorching sunshine to take the place of deep shade from this point downstream. Just below Collins Canyon the hiker passes through the Narrows, another point where the Gulch once carved a shorter path by breaking through a wall and leaving an abandoned creek section high and dry. Some very distinct small anthropomorph groups are found at the downstream end of the old meander, just past the Narrows on the right. The anthropomorphs have linked hands. One group has a bird, another a quadruped beside them. About a mile down canyon past a gooseneck lots of handprints occur on the right. Over a mile further another panel is found on the right. Thirty some anthropomorphs in white, red, yellow, orange, brown and green represent various styles and epochs of painting. Several of the white figures are partially outlined with white dots instead of lines, others are decorated with dots. 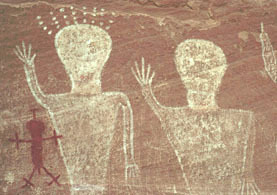 Three small red anthropomorphs are a late superimposition and appear to be Puebloan. They have stylized heads. These, a few small anthropomorphs and the group of brown figures at the center bottom of the panel are undecorated. The large faint white figures are decorated with dots, necklaces, belts, horns, head attachments, brown lines, zigzags above the head, and solid painted areas. Only two have eyes. Birds are superimposed on several figures as is the brown group of smaller animals and anthropomorphs. 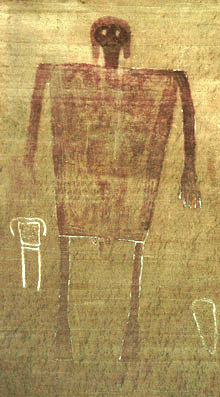 Two distinct medium sized anthropomorphs with long, thin necks and round heads have large, oversized hands with three digits. Most of the large white anthropomorphs are armless. Four small anthropomorphs are simple stick men. Several brown handprints and a few geometrics complement the large and busy scene. Wavy dune lines in the sandstone backdrop add color and texture to the vast "canvas." Within another mile Big Panel, Grand Gulch's largest, fills an alcove on the right (click image for larger view). 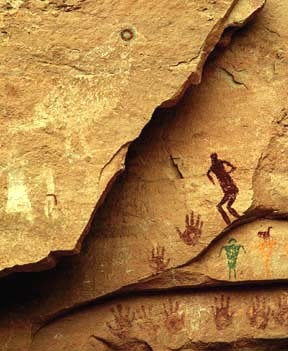 An array of many pictographs and a few faint, Archaic petroglyphs compose the vast panel. Ravens, long-legged and legless birds, bighorn sheep and other mammals, lines of racing stick figures in side profile, a footprint, atlatls, waving lines, raked lines, circles, possible chili peppers, small solid painted anthropomorphs, outlined anthropomorphs, dot group headdresses, and a quadripartite blue and white circle all surround the two large anthropomorphs, each with an upraised arm. The large, rounded heads on these two central figures are reminiscent of space helmets. One has 28 dots in 8 rows for a headdress. A small red anthropomorph with crosses for hands and feet adjoins this figure. To the right the base of a triangular anthropomorph with a 25 dot headdress and three elongated fingers is connected to the head of another. Most of the panel was painted in white. Blue, browns and reds were also employed. Here follows a view across canyon, looking in an easterly direction from the panel area, and another panel detail. With fewer springs and a less hospitable canyon downstream, less evidence of prehistoric occupation occurs. Over a mile past Big Panel another two sites occur, one near Red Man Canyon, 42.3 miles from Kane Gulch, and another nearby downstream. From this point I made my way out of the Canyon and across the mesa back to my vehicle and Highway 276. I cannot report on the last nine miles of the hike to the San Juan River.